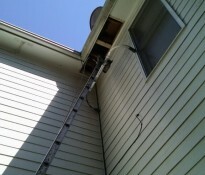 Nuisance wildlife can cause many different types of damage to your home. Georgia P.A.W.S wants to make sure that once we are done, your house is back to how it looked before your unwanted guest arrived. 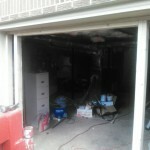 Our trained technicians are skilled in all services that we offer. 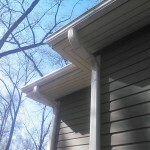 They can do soffit and facia work, minor home repairs, painting and any other general cosmetic work that your house needs. 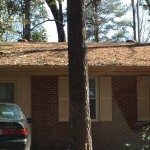 Below is a house in Decatur that had squirrels. 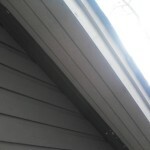 Notice the damage to the soffit boxing on this craftsman style house. The squirrels had made this area a home for themselves. 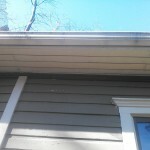 Once the old 1×4 wood is removed, notice the nesting that the squirrels had created using the insulation from attic. If you look closely, you can see our guys hard at work cleaning out this nesting. Look how good of a job they did! No more nesting to be seen. 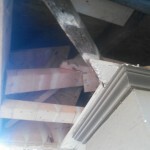 The next step is to seal the soffit boxing area with hardware cloth so that the squirrels cannot make their way back into the attic area. 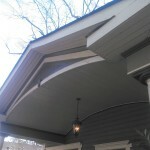 And finally, we replaced the craftsman style soffit boxing with hardiboard. 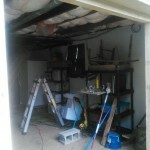 Below are pictures of the finished product. Just in case any squirrels were still in the house once we got everything sealed up, one hole was left open for them to escape through. Over that hole, we set an excluder trap. 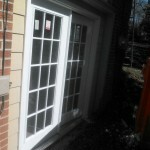 This is a one way trap that allows any lingering squirrels to escape, but with its oneway door, they cannot return into the house. Our guys return a day or two later to remove the trap, free the squirrels, and seal up that last hole. 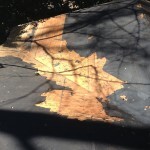 This next house in Athens had years of damaged caused by raccoons and tree debris. ( And when I say raccoons, I mean lots! I think we set a record at this house with the number that we caught!) 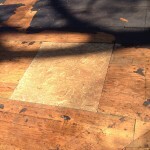 We removed all of the original shingles (and debris) and replaced the roof decking that was damaged by those raccoons. 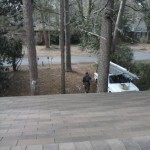 Last, but definitely not least, we replaced all the shingles and roof vents. WOW, what a difference! 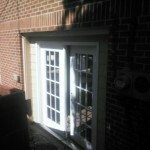 Not only did this house in Athens get a new roof, but we also transformed their garage door into beautiful french doors. 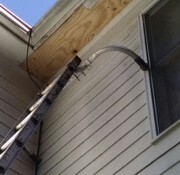 Here are a couple of pictures of our technicians repairing rotted soffit on a house in Lawrenceville.